The company purchased the 238-unit Oxford Station residential community for $60 Million. 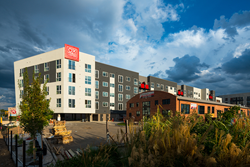 The Oxford Station apartments are located immediately adjacent to the light rail, and less than 20 minutes from Downtown Denver. "Oxford Station offered a unique opportunity to buy a phenomenally-built product with modern amenities at an attractive basis," said David Nelson, the Managing Director of Acquisitions for Hamilton Zanze. Hamilton Zanze (HZ), a San Francisco-based real estate investment company, has acquired the 238-unit Oxford Station residential community in Englewood, Colorado for a purchase price of $60 Million. The property consists of two large, 5-story buildings with a total of 182,991 net rentable square feet across a mix of studio, one, and two bedroom units. Unit occupancy was 96% at the time of the transaction. Designed for luxury, the community offers a state-of-the-art fitness center with virtual workout classes, a sky-level entertainment lounge; a social lounge; a zen lounge; a pet washing station and dog park; on-site secure storage; enclosed bicycle parking; a pool with hot tub and barbeque area; an outdoor gaming area; bike, ski, and board repair station; and structured parking, all against mountain backdrop. “Oxford Station offered a unique opportunity to buy a phenomenally-built product with modern amenities at an attractive basis. The property is located adjacent to a light rail station, providing residents with convenient access to Downtown Denver and an ever-expanding rail network. CBRE, specifically David Potarf, exceeded our expectations and we look forward to working on our next deal together soon,” said David Nelson, the Managing Director of Acquisitions for Hamilton Zanze. The property, located at 4101 S. Navajo Street, was originally opened just over one year ago in 2016, and developed by Littleton Capital Partners. Given its immediate adjacency to the popular RTD Southwest Light Rail line, the property has maintained high occupancy levels since opening. Management of the community has also been transitioned to Hamilton Zanze partner Mission Rock Residential, a Denver-based company. This is one of seven properties now held by Hamilton Zanze across the Metro Denver region, and the first in Englewood. Additional HZ properties in Denver include Platte View Landing, The Vistas at Stony Creek Apartments, Belle Creek Apartment Homes, Highpointe Park Apartment Homes, The Diamond at Prospect Apartments, and Harvest Station. Hamilton Zanze (HZ) is a private, San Francisco-based real estate investment company that owns and operates apartment communities. Since its founding in 2001, Hamilton Zanze has acquired over $3.2 billion in multifamily assets primarily in the Western, Southwestern, and Eastern U.S. The company currently owns and operates 84 properties (18,425 units) across 10 states. For additional information, visit http://www.hamiltonzanze.com.